For real, it sounds a lot like sour grapes to me. Gee, wow! What expectations have we older ones put on this group of youngsters that they must be made to feel like they have disappointed us so badly? It’s been said that this generation is doomed. Shackled by huge personal debt, shaken and pounded by the falling debris of the tectonic-plate shifts of recessions and other economic “adjustments,” and haunted by a real lack of single-job options that can actually cover their costs of living, this supposedly techno-addicted crowd of privileged, me-centered youngsters with the attention spans of gnats are going to sink into mediocrity and gloom, eking out their dismal existence in their parents’ basements…it says here. Micah Tyler sings an a capella song. “You’ve Gotta Love Millenials,” that is bouncy, cheerful and teasing about the very real problem this generation (and the rest of us) face. The doom-and-gloom predictions and all that bugaloo-ing “awfulness” story-telling just does not jibe with the young people I know. As far as I can see, the young ones of my acquaintance do not match the much-bugled stereotypes. The labels plastered all over their cohort group by the assorted haters are lies. They are bright, these young ones. Some of them are even brilliant. They are eager to get their hustle on. Some of them work 18-hour days to make ends meet as they master some discipline, trade, or profession. Often they take on side-gigs that expand their skill-sets or they invest in their own continuing education. Some of them have taken off on adventures that expand their view of the world, tasting life in other places, looking for a place to land or trying to clarify some vision they are pursuing. Others delve into their roots, looking for wisdom in the ways of the ancients. Some of my young friends band together to make some grand scheme fly, cobbling together constructs that often fall short of their aims. Their failures do not keep them from trying again. These young friends of mine are a rowdy and boisterous crew. They are the freedom-runners. They have abandoned “career ladders,” choosing instead to forge new trails through the uncertainties of a world that does not hold still, a world that seems to be falling apart….the very same falling-apart world that every generation before us all have lived in. The Millennials I know are often unsure of where they are going, but they try to keep running on with hearts held high. They are filled with confusion and doubt about their direction. They are almost never sure how to answer the inevitable questions about where they think they are headed. Many of them are looking for a direction that makes sense to them, one that has meaning for them. Others of my young friends (as well as many older ones) who followed more conventional road maps now feel trapped by their earlier choices. They may want to make a change, but are reluctant to chuck out the good things they have already built. Often they have taken on obligations and responsibilities that hold their feet to the fire. They, too, are looking for a way to move in a direction that makes sense to them towards a life with more meaning and mana. Comes now a book, THE QUARTER-LIFE BREAKTHROUGH, written by a fellow Millennial. The author, Adam Poslowsky (who prefers to be called “Smiley”) is a young professional who paid attention as he worked through the daunting process of re-inventing himself. Smiley learned to ask the Big Questions that helped him find his own meaning and mana as he re-made himself from a professional administrator/facilitator at the Peace Corp headquarters in Washington, DC into a writer, public speaker and career-change couch living in San Francisco. The book is packed with real-life stories of people who are succeeding in making the transition to more personally fulfilling lives and work choices. Smiley also draws on his own experiences to point out new ways of looking for paths to reach the over-riding goal. 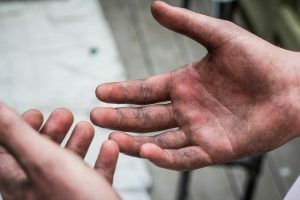 He does not hand out the easy, clichéd advice that says you have to quit your job and go chasing after your “passion.” He points out that passions change. He points out that while you are making the shift, you do still have to eat and keep a roof over your head. What Smiley does in this book is hand you a tool box of questions and exercises and head-games as well as a dollop of resources to tap as you figure out who you are and what moves your heart now, the gifts you hold, and the impact you want to make on the world. From there he helps you take a look at your available options and suggests ways to beta-test your ideas and your potential directions without blowing up your world. After that, it’ll be up to you to make your moves. This book was a crowd-funded, self-published work that made good. It was successful enough on its own (with a lot of hustle and thought put in by Smiley and his crew) to be picked up by a more traditional publisher. The author includes that story in the book as well. 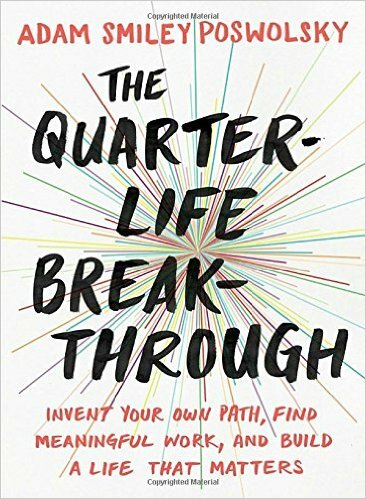 I found THE QUARTER-LIFE BREAKTHROUGH to be an extraordinarily honest, down-to-earth and heartful book. If you work it, I am convinced that it can guide your own Inner Smarty-pants to find the Life Answers that can work for you…even if you are NOT a Millennial and have lived way past your own quarter-life mark. That doesn’t seem to be happening. Blowing around in a world of heavy winds. Into component parts of exceptional elegance and grace. That happened to be sitting around at the time. Wouldn’t THAT be a kick in the head?